It was eight years ago on the 11th November 2008 that I took delivery of Dreamagic. 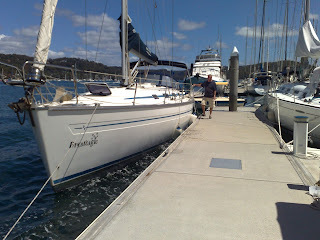 I had driven down to Pittwater from Cairns with Des Vizzard, to take possession. The plan was to spend a couple of days on her in Pittwater, he would then take my car back to Cairns while I stayed aboard, and he and some other crew would fly down early in the New Year and sail her to Brisbane, and then Cairns. On first seeing her Des's only comment was :"They will hate you at the Yacht Club"
I spent that Christmas on board with friends, watched the start of the Sydney Hobart on the harbour, and the NYE fireworks. The crew of 5 including Matt Regan and Richard Winter joined and we sailed her to Brisbane. 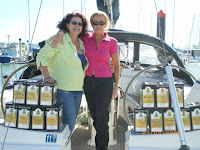 Since then she has sailed the East Coast of Australia several times, crossed the Coral Sea to The Louisiades and back twice and been to Lizard Island twice. She has competed in a Brisbane to Gladstone, two Airlie Beach Race Weeks,, three Magnetic Island Race Weeks, and two Port Douglas Race Weeks. She has hosted probably a thousand people for parties. When she was in North Queensland originally she was based at Yorkey's Knob. I would spend the morning bringing her around to the inlet to be involved in WAGS and the legend of the Dream Girls was born. Simone, Shauna and Ashley Ayre were the originals and we may not have had the fastest boat, but we certainly had the best looking crew. For years I thought it was my boyish good looks and natural charm that brought the girls back, but I was eventually told that being the only boat in the fleet with a toilet was a big draw card too. A lot of people who sailed on her went on to buy their own boats. Vic Black, Jeff Hammond, Kerri Adams, Ashley Burke, John Pool, Louis Schofield, and most recently Andy Barbour got into, or renewed their interest in sailing sufficiently to lay out large lumps of cash and buy boats. I am proud of that. She has had her fair share of excitement. We rode out Cyclone Yasi in Pancake Creek with only the daily VHF transmission from the Coastguard for company and we were eventually rescued by the Coastguard after a microburst hit us on a beautiful sunny day just off Bundaberg, but she came through. And recently she has taken to taking holidays each year in the Whitsundays, attending the Shag Islet Cruising Yacht Club Rendezvous. For the third year running we have taken assorted crew down and back to the Whitsundays. They have been a real cross section of the demographic but united in a love of sailing and a need for adventure. Dreamagic is leaving Cairns in December to go south to Brisbane. 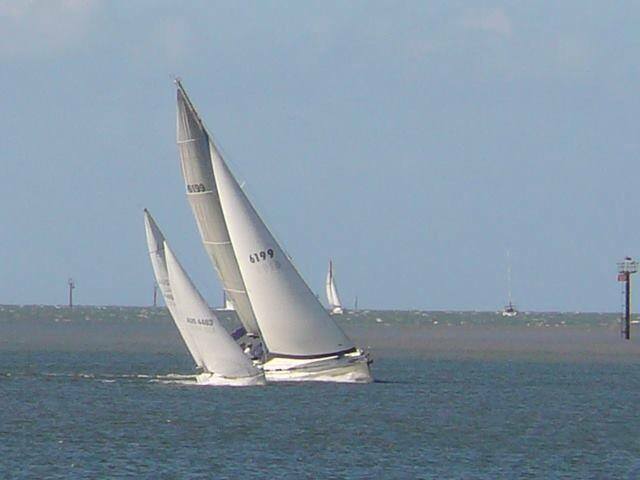 This time I have a reason to stay down there for a couple of years so she will be based at her old club, Royal Queensland Yacht Squadron and sailing in Moreton Bay. Then i hope to bring her back North, en route for the Sail2Indonesia rally in 2019. 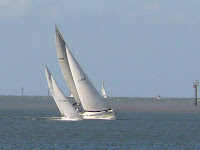 I have pretty much given up racing now, but WAGS there is good fun so look for sail number 6199 on the horizon! Most of these stories can be found on this website if you are interested. If you are interested in sailing between mid December and mid January on her trip south, even for only part of it, get in touch.